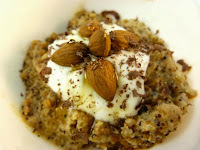 Today was Day #7 of Chocolate and Quinoa Theme Week, and Day #1 of Chocolate and Honey Theme Week. Earlier this year, I noticed that Torn Ranch (Petaluma, CA) was offering a line of Organic, "Signature" chocolate bars. I tried the milk chocolate version earlier and found it to be well balanced, and very good for a milk chocolate bar. 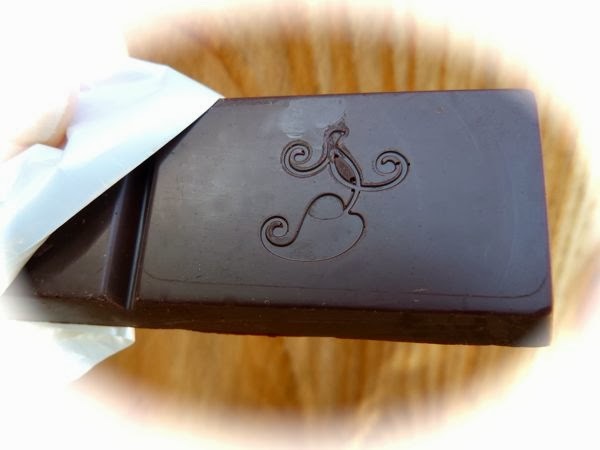 Today's Organic Signature Dark Chocolate bar was also good, with a dark, slight earthy flavor profile. I enjoyed today's chocolate bar by itself for breakfast, and also made good use of part of this same bar to flavor a bowl of cereal. 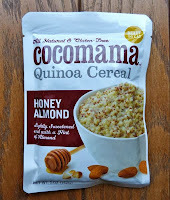 Quinoa cereals have grown more popular, including this single serving, ready-to-eat pouch of Honey Almond Quinoa Cereal from Cocomama Foods (Boston, MA). It was very convenient to make and tasted good heated up a bit. However, I thought it was even better, topped with a bit of extra toasted almonds, honey and shaved dark chocolate.